Sigh....so sorry your tickets will go unused. Peggy - I wouldn't say the tickets are going completely unused. They are going in the scrapbook. Kathy, thanks for taking the time to share your thoughts. 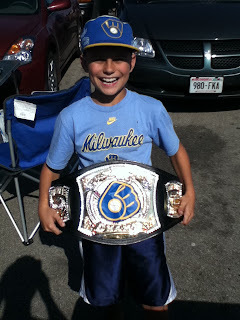 Our family has been to a lot of Brewers games these past few years, but none were as electric as the postseason games. It was good meeting you too, and hopefully our paths cross again at Miller Park. With the same result as game we attended together.